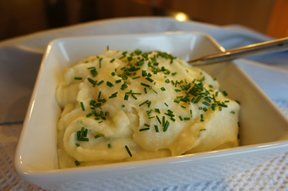 A hint of garlic in mashed potatoes changes it from ho-hum to scrumptious. Serve it anytime of the year, from a family dinner to the Thanksgiving feast. 1. Place potatoes in 2-quart saucepan. Cover with water. Bring to boil. Reduce heat to low; cover and simmer 10 minutes or until potatoes are tender. 2. Drain and return potatoes to saucepan. Add garlic and salt. 3. 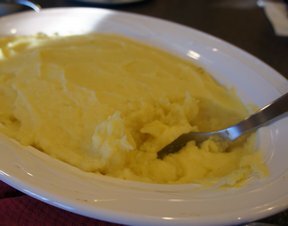 Mash with potato masher, gradually adding milk, then butter. 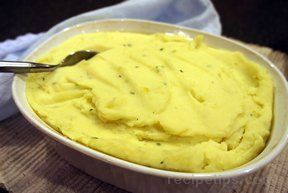 Stir in cheese and parsley.Almost-Instant Garlic Mashed Potatoes: Stir 1 teaspoon McCormick® California Style Crushed Garlic made from Fresh Garlic into 4 cups prepared (instant or refrigerated) mashed potatoes. Add 1/2 cup shredded Cheddar cheese, if desired.